The Association of Research Managers and Administrators conference was held in Southampton last week, and I’ve only got time to scribble a few words about it. It’s a little frustrating, really – I’ve come back from the conference with various ideas and schemes for work, and a few for the blog, but I’m on annual leave until the end of July. While I’ve always written this blog in my own time, I’m going to have a near-complete break (apart from perhaps a little Twitter lurking) so my reader will have to wait until July at the very earliest for the second instalment of my impact series. 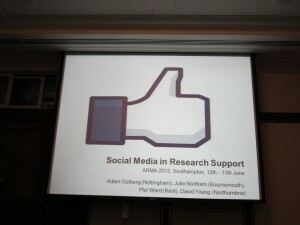 I co-presented a session at ARMA on ‘Social Media in Research Support’ with Phil Ward of ‘Fundermentals‘ and the University of Kent, Julie Northam (Bournemouth University Research blog), and David Young (Northumbria University Research blog). Phil has written a concise summary of the plenary sessions, and our presentation can be found on the Northumbria blog. I have a slight stammer that I’m told that most people don’t notice, so I’m not a ‘natural’ public speaker, but I’m very pleased with the way that the session went. I’m very grateful to my three co-presenters for their efforts and for what really amounted to quite a lot of preparation time, including a meeting in London. I’m also very grateful to the delegates who attended – I think I counted 50 or so, which for the final session of the conference and scheduled against a very strong line-up of parallel sessions, was pretty good. It was a very warm afternoon, but energy and attention levels in the room felt high, and this helped enormously. So if you made it, thank you for coming, thank you for your attention, and most importantly of all, thank you for laughing at our jokes. David opened the session by asking about the audience’s experience with social media, I was surprised at how much experience there was in the room. We weren’t far short of 100% on Facebook, probably about 20% or more on or having using Twitter, and four or five bloggers. Perhaps it shouldn’t have been a surprise, as perhaps the title of the session would have particularly appealed to those with an interest or previous experience. But it was good to have an idea of the level to pitch things. The session consisted of a brief introduction and explanation of social media, followed by four case studies. Phil and I talked about our motivations in setting up our own blogs, our experiences, lessons learnt, and benefits and challenges. Julie and David talked about their experience in setting up institutional research blogs, and how they went about getting institutional acceptance and academic buy-in. It was interesting to see that the Open University had a poster presentation about a research blog that they’ve set up, though that’s internal only at the moment. ARMA itself is now on Twitter, and this was the first year that the conference had an official hashtag – #ARMA2012. While there’s no need for an official one – sometimes they just emerge – it’s very helpful to have an element of coordination. I don’t think blogging or social media are going away any time soon, and I can only see their usage increasing. – though I do have reservations about scalability and sustainability. As I said in the presentation, my motivations in setting up a blog were to try to join in a broader conversation with academics, funders, and people like me. We get to do a lot of that at the annual ARMA conference, but it would be good to keep that going throughout the rest of the year too. A secondary motivation was to learn by doing – I’m expected to help academics write their pathways to impact, which almost inevitably involve social media, and by getting involved myself I understand it in a way that I could never have understood as a mere bystander. My blog is now a few weeks shy of its first birthday, an auspicious event marked by a birthday card invoice from my hosting provider, and a time for reflection. I’ve managed reasonably well to hit an average of 2-3 posts per month – some reactions to news, some more detailed think pieces, and some lighter reflections on university culture and life. That’s not too bad, but looking into the future I wonder whether I’ll be able to sustain this, and whether I’ll want to spend my own time writing about these things. While I’m hopeful that I might be able to shift a little of the blog into my ‘day job’ (discussions on that to follow), one other option is to share the load, and I think the future for most blogs is multi-author. Producing semi-regular, consistent quality content is a challenge, and I’m going to be soliciting guest posts in the future to feature alongside my own – whether that’s semi-regular or one off. So, if you’d like to write occasionally but don’t want a whole blog, this might be a good opportunity. Happy to discuss anything that’s a good fit with the overall theme of the blog. Please drop me an email if you’re interested – I don’t bite. One issue that came up in the questions (and afterwards on Twitter), was the question of the personal and the professional. My sense was that a fair few people in the room had their own Twitter accounts already, but used them for personal purposes, rather than for professional purposes, and were concerned about mixing the two. Probably there was little or no reference to their job in their bio, and they tweet about their interests and talk to family and friends. This issue of the personal and the professional was something we touched on only very briefly in our talk, and mainly in reference to blogs rather than Twitter. But it’s clearly something that concerns people, and may be an active barrier to more people getting involved in Twitter conversations. Probably the one thing I’d do differently about the presentation would be to say more about this, and I’ve added it to my list of topics for blog posts for the future. Unless anyone else wants to write it? What a timely post! I’m running a short session with staff who support researchers at UWE tomorrow on the use of social media. I’ve done this with researcher developers (like myself) and with research students and staff in the context of using social media in academic research. I hear you w.r.t. the ‘digital identity’ issue, it’s a real concern for most folks – how to keep private as it is and promote the professional. I agree that research development/funding types should make much better use of the tools available to keep the conversations going and to help with the sharing of practice, it makes total sense to me. Hi Paul, thanks for your comment and the link to your presentation. I’ve had a very quick look, and it looks excellent. I’ll have a more detailed read when I’m back in the office. I’ll re-tweet it then, if I may. One of my other recent posts (which I think is still just about under the ‘recent posts’ heading) was an attempt to collate a series of links to useful resources for academics and others considering making (greater) use of social media, and I’d be grateful for any others that you’ve come across in preparing your session.